Glitch provides a fully hosted development environment for building remixable web apps. 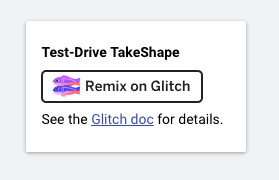 You can use Glitch to try out TakeShape, or use it to build out a complete app. Creating a project from certain templates allows the Glitch module to appear on the Setup Steps page. Currently only the "Shape Blog" template is remixable on Glitch.